Invitation to apply for registration to a series of adventure hikes. Those who are used to surfing the site of Mountain Wilderness International already know or can learn about the purposes and different phases of what the Asian Desk of the association called The Swat Project. Suffice it to remind you that the Swat is a fascinating mountain region of Pakistan, easily reachable from the big cities of the plain and, for this reason, exposed to the risk of a disorderly growth of a basically aggressive, uneducated and disrespectful tourism. Mountain Wilderness believes that the only way to preserve the precious integrity of those valleys of magical beauty lies in the establishment of a national park. The route designed to get there passes through four successive steps. 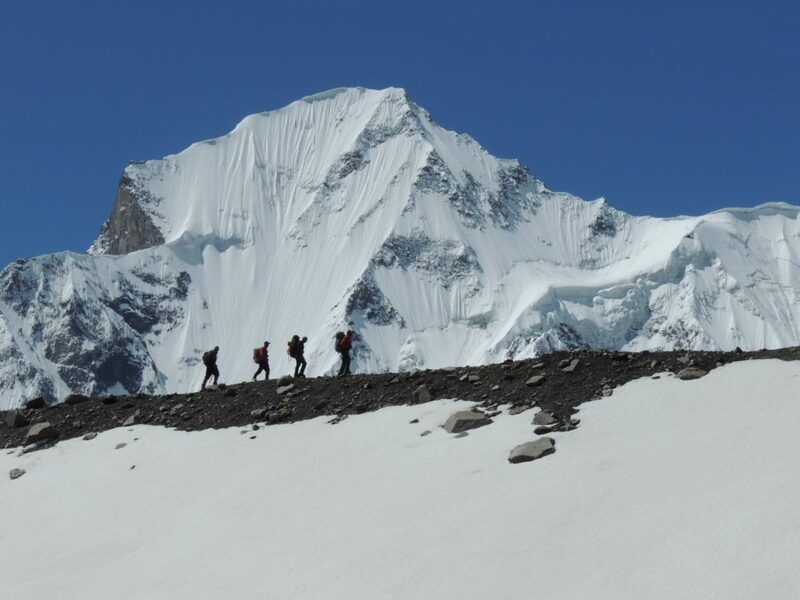 Training of a group of young local people as reliable trekking guides, that may at the same time work with us to develop a hiking / mountaineering guide of their mountains. This guide, inspired by the principles dear to Mountain Wilderness, may have a positive influence on future tourist choices and will represent an important precedent to convince national authorities to establish the park, entrusting us with the project. In September 2018, the Asian Desk successfully completed this first step, by holding an Environment Friendly Mountaineering course attended by 21 local students (all details on the site). Exploration and description of possible trekking routes and verification of the mountaineering potential of the main mountains of the area (up to 6000 meters high). We would like this exploration to be carried out by small groups composed in equal measure of members or sympathizers of Mountain Wilderness and by our best former local trainees, who would also act as guides, cooks and organizers. Arrangement of the materials produced under point b and production of the paper guide in English. Development of the “National Park” project to be submitted for approval and implementation to the Government of Pakistan. This invitation concerns point 2 and has only a preliminary value. We propose to the members of the national Chapters of MW, to the members of CAAI, to Alpine Clubs which share our ideas, to all expert trekkers to participate to the exploration and to the accurate description of potential trekking itineraries as “partially paying guests”. An exciting experience, free from any risk due to political instability or fundamentalist upheavals. An authentic adventure, to identify routes that are often still completely unknown and therefore cannot be fully planned in advance. The current cartography of the area leaves much to be desired. To the enthusiasm for the discovery of deserted valleys, passes, glaciers, must be added and taken into account also the possibility of some withdrawal due to obstacles that could turn out to be too difficult. Some of the routes may require the crossing of glaciers and the consequent use of crampons, ice axe and rope. Those who want to take part in the project may specify if they are willing to face also this type of difficulty. However, the following are indispensable: ability to adapt, spirit of adventure, awareness of the meaning of the project and its ethical/environmental value, willingness to describe in detail the path covered. Basic knowledge of the English language (or… Urdu!) would be very useful. Duration: considering the morphology of the area, no route will last more than 9/10 days. It might happen that two different routes of shorter duration are coupled. Calculate twenty days in total. It is also possible to devote a couple of days to hikes to the “romantic” ruins of the ancient Buddhist monuments that dominate the hills of the southern part of the Swat region. In principle, we expect for the current year eight groups each consisting of two members of MW in good physical shape (or other friends close to our association), two former local trainees who successfully completed the course and received the trekking guide Diploma, a keeper of the camp, some porters. Departures staggered between August 15 and September 10. Real cost (for now only indicative): € 1600 per participant. MW is considering contributing € 500 per participant, so that the actual cost would be € 1100. This figure excludes air travel because price differs according to the country of departure. For their part, participants must formally commit themselves to providing a detailed description of the itineraries, depicting their features, their altitude difference, their duration, stage by stage and accompanying the text with photographs. To avoid any misunderstanding: those who participate should not consider themselves as passive customers, who claim to be entitled to a full service from the organizing body. Tasks such as the choice of where to settle camps, pitch and disassemble tents, kitchen related duties, must be made actively and in good harmony by each member of the group, whether European or Pakistani. Those who are potentially interested are kindly requested to express their availability in principle no later than by the end of January, by sending an e-mail to: bettopinelli@gmail.com. Mountain Wilderness and ISMEO have entrusted Adventure Tours of Pakistan, one of the best known local travel agencies specialising in outdoor activities, with the overall management of trekking. In due course each participant will be asked to contact their offices directly.ATP will make all the arrangements regarding camp supplies, reception, hospitality, overland transport, logistics, permits and insurance, and will release Mountain Wilderness of all civil and penal liability.